Probably the nave at the N.\XI. was rebuilt late in the 15th century on the site of the earlier church recorded from the 13th century.2 The chancel at the N.E. was added ca. 1520, the arcade and S. aisle ca. 1530. Both the chancel and the E. end of the S. aisle have gable corbels inscribed with what appear to be 16th-century dates, using black-letter for arabic numerals. The W. tower was added in 1534, and the S. porch and the double screen and rood-loft are probably contemporary with this final work. 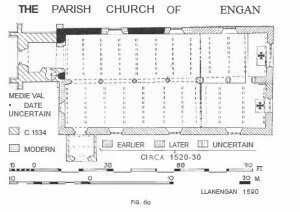 The arcade may be compared with those in Llangwnnadl Church (No.1638) and in Bangor Cathedral (II, No.681). 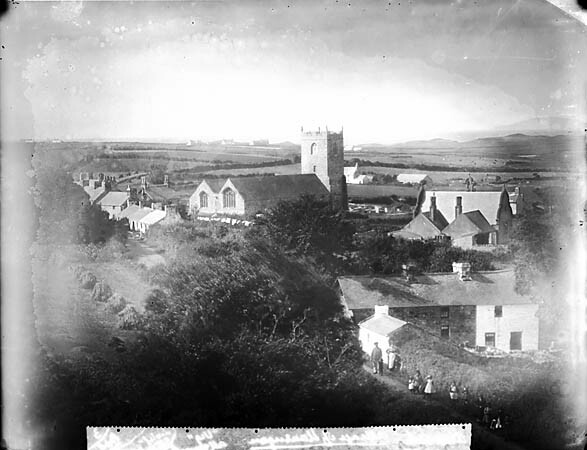 The church was restored in 1847 3 and further repairs were made in 1937-8. It contains much of architectural interest, especially the screen and rood-loft, the roof trusses, and the inscriptions. The walls are of roughly coursed rubble with large quoin-stones. The original dressings are of grey gritstone, the modern renewals of finer yellow grits tone. The roofs are covered with modern slates, generally on raised eaves. The lower part of the E. wall is hidden, but the N. wall of the chancel and that short length of its original S. wall which survives at the E. end of the arcade are built on a roughly sloped plinth, and the quoin-stones remain at the former S.E. corner; the straight joint there shows that the S. aisle was a later addition. The N. wall of the nave appears to be of one build with that of the chancel, but the rough plinth is limited to the latter. This suggests that the nave walls may incorporate part of the fabric of the earlier church which is known to have existed in the 13th century. The quoins at the N.W . angle are very large, and although none remains at the junction between nave and chancel they could have been removed when the church was enlarged. arcade of two bays (Plate 15), each of two orders hollow-chamfered continuously with the octagonal pier or semi-octagonal respond, at the square base of which both orders terminate in a single splayed stop above each corner of the chamfered square plinth; the E. arch, which had been rebuilt before 1847, is now semi-circular; the wider W. arch is depressed pointed, somewhat flattened on the E., with its crown at the same height as the other, and is apparently original. hoodmould, and is probably of the same date as the tower, 1534. The arcade on the S. belongs to the S.
aisle, having replaced the S. wall of the nave. The S. Aisle (82 ft. 3 ins. by about 18 ft. 3 ins.) is apparently of one build except perhaps for the arcade along the nave, which may have been opened shortly afterwards though probably by ca. 1530.
possibly for the brackets of an overhanging window or staircase from inside the church to the porch (see below). The door itself, framed and nail-studded, and its strap hinges seem original, but the door has been repaired on the inside. The W. window is modern but may occupy an original opening. Externally the W. wall has a chamfered plinth, which continues around the base of the tower. The arcade between this aisle and the nave on the N. (Plate 13) is of four bays, each with a four-centred arch of four orders on octagonal piers or semi-octagonal responds, with moulded capital and base (Plate 16); up the splay of every pier or respond runs a double cut, similar in section to those in the S. arcade at Llangwnnadl church. Dating probably from ca. 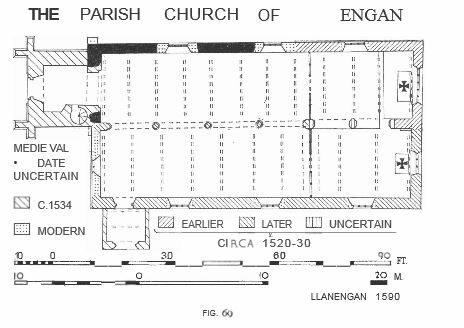 1530 (like that arcade at Llangwnnadl), it marks the completion of the S. aisle and of the body of the church. The S. Porch abuts on the S. aisle but seems nearly contemporary. It formerly had an upper floor, a small and plain rectangular window for which remains on the S. The entrance archway (Plate 20) is four-centred on semi-octagonal responds with moulded imposts; the arch is moulded like the chancel arcade, and the top stone of the W. respond like the piers of the arcade. Above is a small window with plain jambs and straight head. Internally the side walls have been rendered with cement scored as ashlar. There is a stone bench on either side, now almost buried by the floor. TI-:e w. Tower (Plate 8), added in 1534, is of three stages IS nearly square (11ft. 3 ins. by 12 ft. 6 ins. ), with an internal projection at the S.E. for the newel stair. At the base is a chamfered plinth, continuing that of the W. wall of the S. aisle. Below the sill of the lower W. window is a moulded string, and at the foot of the parapet a similar string. The parapet is battlemented and coped; its corners have crocketted pinnacles. The free angles of the tower are buttressed to half-height, each buttress having three hollow-weathered set-offs. There are five short slits lighting the stair, all having chamfered jambs. The W. doorway (Plate 21) has a four-centred head casement-moulded continuously with the jambs, outside which the base plinth is returned downwards. The head is contained in a square frame which with most of the spandrels has been coated with cement. Above, in two lines of raised letters nm-ning from buttress to buttress, is the inscription recording the building of the tower in 1534 (see under Fittings-Inscription v); it is much weathered although the string serves as a hood. Above is a window of two pointed lights under a round head which has a casement mould continuous with the jambs, much repaired in cement. From the interior the ground stage is open to the nave through the tall arch already noted from the nave; towards the tower this arch has a plain roll-moulding on square jambs. At the N.E. is a modern fireplace. At the S.£. the stair is entered by a narrow doorway having a four-centred head and hollow-chamfered jambs. Between the ground and middle stages a doorway with four-centred head and chamfered jambs opens off the stair into a small lobby within the thickness of the E. wall, and from the S. side a stair, now blocked, led down to a latrine contained in a screen wall built between the S. wall of the tower and the gable of the S. aisle. On the W.of that wall is a corbelled projection for the shoot,the outlet of which is now blocked by a stone rain-water head. The middle stage of the tower has a modem floor, carried on two chamfered beams which run E.-W. resting on offsets. There is a square-headed doorway from the stair and another in the E. wall, its threshold just above the ridge of the roof of the nave. The belfry or top stage is entered from the stair by a similar doorway. There is a window in each wall, each of two pointed lights in a pointed two-centred head splayed with the jambs; the chamfered jambs and mullion each have a small cusp at springing level. The roofs (Plates 22, 23) are continuous in both aisles; that on the N., over the nave and chancel, consists of twelve trusses forming eleven bays, that on the S. of eleven trusses forming ten bays (all resting on modern stone corbels); all have arch-braced collar-beams with plain chamfered soffits except where noted otherwise, but there are differences in scantling or detail and only those on the N. have wind-braces. However, all seem to be of the early 16th century with the possible exception of seven over the nave. Of the eight trusses over the nave the first seven from the W. are heavier than any others, and have collars shaped to a bluntly pointed arch struck from two depressed centres only. The first is without struts, the next two have plain raking struts, the last four have struts cusped to form a quatrefoil flanked by trefoils (Plate 23). The original wind-braces are cusped also, though many have been replaced by plain ones. Possibly this group may have been taken from the earlier church, assuming that it was nearly co-extensive with the present nave; if so, they should be of the 14th or even the 13th century; yet in style they resemble others that are well dated to the 16th century. The other five on the N., comprising the last truss over the nave and the four over the chancel, are slighter in scantling, have a four-centred arch with a boss at the apex instead of a plain chamfered and two-centred arch, and have plain but slightly curved struts. They have wind-braces like the fmt seven. The easternmost bay is boarded and ribbed to form a canopy of honour, springing from a battlemented cresting which is in part original on the N. though renewed elsewhere. This group of five would date from the completion of the N. aisle in the 16th century. The eleven trusses in the S. aisle (Plate 22) form flatter angles than those on the N., and show more variation in design, though all appear to be original and contemporary with the aisle (ca.1530). Counting from the E. end, the first three are plain and have no struts; these, and the E. side of the fourth truss, are slotted to take a canopy of honour. The fourth truss, above the screen, has two wide upright struts, and a cusp between them in the angle formed by the principals; it is chamfered on all edges and a hollow chamfer on the W. side of the softit. Trusses 5, 6, and 8 have raking struts cusped to form a quatrefoil flanked by two trefoils. Truss 5 has double hollow chamfers on the soffit, and truss plain chamfers with widely-spaced stops; each has a rosette at the apex, and truss 5 has an inscription (No. vi below) recording the restoration of the church in 1847. Truss 7 has a single upright strut; this, the spandrels and the softit arcall multicusped. The three remaining trusses are plain; truss 9 has two raking struts, truss 10 a single upright, and truss II none. The contemporary roof of the S. porch is on a central truss and another to the N. against the wall of the S. aisle. The central truss has an arch-braced collar with chamfered soffit ending in a concave cut at the foot of either principal. The N. truss has a cambered but plain collar-beam. Purlins are let into the principals of both trusses. The roof of the W. tower is on two trusses running N.-S. The W. truss seems unaltered, consisting of a heavy stop-chamfered tie-beam, a short strut mortised into it at the centre, and stout rafters of low pitch. The E. truss is similar but apparently it has been reconstructed, a beam with a double hollow chamfer on the soffit edges having been re-used as tie. (Plate 20), to S. of the church, is rubble-built and has wide openings. It is roofed on three collar-beam trusses which utilise some 16th-century timbers, and is covered with modern slates. Arch. Camb.,1848, pp. 316-21; ibid., 1942, pp. 58-63; ibid., 1944-5, pp. 74- 6, 78, 103-7; ibid., 1956, p. 158; Hanes Eglwysi, pp. 147-66. 1 ‘Where was late a great pilgrimage’, Leland, p. 87, his visit falling between 1536 and 1539. The church with its shrine and effigy of the saint is mentioned by Hywel ap Dafydd ap Ieuan ap Rhys in 1460 in his ‘Cywydd Einion Frenhin’, printed in Hanes Eglwysi, pp. 153 ff. ; the church by Hywel (ap) RheinalIt(fi. ca. 1471-94, Diet. Welsh Biog., p.405) on whose poem sec Arch. Camb., 1942-3, p. 60, n. I, in correction of Baring-Gould and Fisher, n, pp. 422-4. 2 Perhaps ‘Lanekiant’ ca. 1254, Valltation of Norwich, pp. 190-1; dearly ‘Llaneign’ in 1291, Taxatio, p. 294; Rec. Caern., p. 36 (extent of 1352); Cal. Papal Registers, Papal Letters, IV, p. 414 (in 1391); return of 1504 in Pryce, p.81; and in 1535, Valor Ecclesiasticus, IV, p. 419; VI, pp. xiv, xviii, ‘Llan Eigan’. 3 By the architect Henry Kennedy, see Arch.Camb., 1848, p.316. 1 In N.L.W., John Parker’s drawings, Vol. I, No. 59. 5 Arch. Camb., 1848, p. 319 and plan p.317. 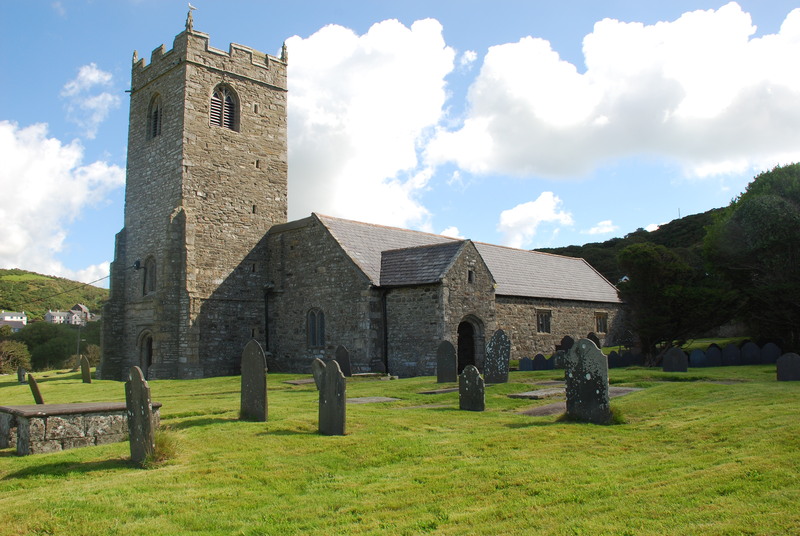 6 None remained in the steeple of Bardsey in 1547, P.R.O. Exchequer, Augmentation Office, Miscellaneous Books,E. 315, Vol. 373, No.!. The bell founder John Scott was known in Flintshire in 1660, Arch. Camb., 1951, pp.141, 158. A tradition that one bell at least is of pure silver appears in Hanes Eglwysi, p. 147, but all are bell-metal. 7 Previously in chancel, Arch. Camb., 1848, plan on p. 317. 8 Previously read as ‘ihsii’, Arch. Camb., 1848,p.319. 9 Previously read as ‘saflii’, ibid. 10 As elucidated by W.].Hemp., Arch.Camb.,1942-3,pp.58ff. 11 Church Plate, pp. 92-3; Halles Eglwysi, p.150; ibid., p. 161 for terrier. 12 F. H.Crossley and M. Ridgway, Arch. Camb., 1944-5, pp. 74-6, 78, 103-7, with profiles in Fig. 2;see especially pp.105-6 for analysis of patterns; if p. 173 on Llanegryn screen, a more complete example of the style. 13 It occurs obversely on a boss of the Llanegryn screen, Merioneth [/lv., p. 91, Fig. 92. Also included in trademark of William Caxton the printer. Cf contemporary forms of numerals in G. F. Hill, Development Nltmerals ill Europe (Oxford, 1915), Table XVII. H Arch.Cafflb.,1944-5, pp.106-7.